fairy-tale hero with a strong female appeal, and wound up being stretched in a dozen different directions by writers of all kinds of disparate series. DC Comics' original Amethyst series ran 12 monthly issues, starting with a May, 1983 cover date. It consisted of a complete, self-contained story about Amy Winston, who on her 13th birthday discovered that what every little girl dreams of was, for her, true. She was, indeed, adopted; and her rightful position was, indeed, as princess of a magical land in another plane of existence. What's more, since time flowed differently in her other-worldly realm, when she was there, she was a 20-year-old woman, Amethyst, and was loved by the dashing and handsome Prince Topaz. 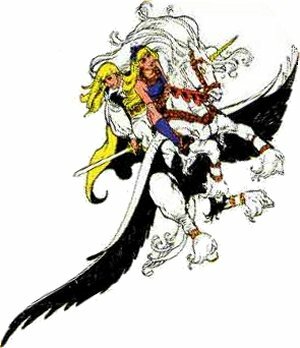 And if that wasn't enough to rope in every adolescent female, in the fifth issue, she got herself a winged unicorn. Writer Dan Mishkin, one of Amethyst's co-creators, is also known for his work on Wonder Woman and various other DC Comics characters, including Blue Devil, which he co-created. Gary Cohn, who co-wrote the initial series, is also known for DC work, and as one of Blue Devil's other co-creators. Amethyst's third co-creator, artist Ernie Colón, was already known for his work at Harvey Comics, where he drew Jackie Jokers, Hot Stuff the Little Devil etc. In Amethyst, as in other DC work such as Arak Son of Thunder, he proved himself capable of excelling in more than one style, delivering a job as different from the standard superhero fare as from his own earlier work. Together, the three crafted a tale of adventure, intrigue, romance, and all the other elements of a fine page-turner, as Amethyst struggled against Dark Opal, who had murdered her parents, to establish herself as rightful ruler of the Gemworld. Even while her 12 issues were running their course, however, the character started being used elsewhere. An early guest appearance with Superman established her as a part of the mainstream DC Universe, and therefore fair game for use in other series. Within a few years, she'd been swept up into DC's first big crossover event, Crisis on Infinite Earths; become allied with Dr. Fate's Lords of Order; and gotten integrally involved with the back-story of The Legion of Super Heroes. She's dropped the Amy Winston persona, merged with the Gemworld itself, manifest herself as a spirit entity, and even been used as a villain. You'd scarcely know her anymore. But if you can find them, those original twelve 1983-84 issues (which have never been reprinted, unfortunately) still make up a fine adventure story for young people.